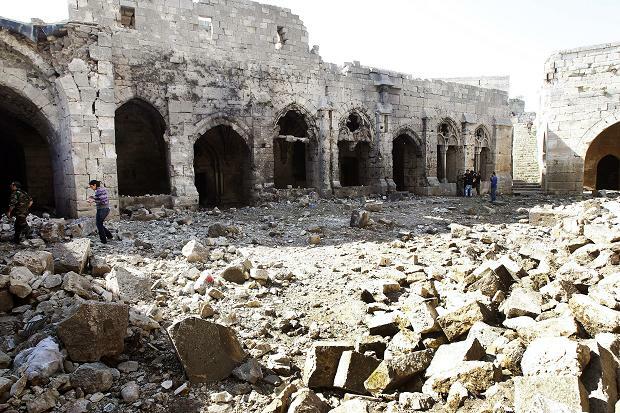 A bomb explosion in a tunnel near Aleppo Citadel in Syria on Sunday damaged a wall of the fortress that is part of the UNESCO-listed Old City, state media and a monitor reported, according to AFP. The blast partly destroyed the wall of the monumental 13th century citadel that overlooks the Old City, said the official SANA news agency and the Syrian Observatory for Human Rights. “A powerful explosion was heard after midnight Saturday. It was caused by the blowing up of a tunnel in the Old City near the Aleppo Citadel,” the Observatory said. “The blast caused the collapse of part of the wall of the citadel,” said Observatory chief Rami Abdel Rahman. It was unclear who was behind the attack, he said, but it was immediately followed by clashes between rebels and government forces who are battling for control of the northern city. SANA said “terrorists” blew up the tunnel, causing the damage to the historic citadel. The Syrian government and its media describe as “terrorists” the various armed groups who have been battling to oust President Bashar al-Assad’s regime since 2011. Rebel fighters in Aleppo, Syria’s second largest city and pre-war commercial hub, have often set off explosions in tunnels that they have dug under military targets before launching attacks on them. The Aleppo Citadel, which contains the remains of mosques, a palace and bath buildings, is one of several sites in Syria on UNESCO’s world heritage list. One of the most famous is the ancient central city of Palmyra, which was seized by the jihadist Islamic State group from government forces on May 21. Syria’s ongoing civil war has caused the deaths of more than 230,000 people, turned more than four million Syrians into refugees, devastated the country’s infrastructure and economy and inflicted damage in many heritage sites.